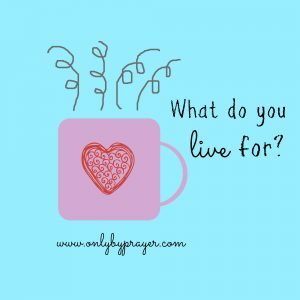 Short & Sweet: What Do You Live For? 17 “Deal bountifully with Your servant, that I may live and keep Your word. I can’t live without my coffee, I heard someone say as she came in the door to Bible study one evening with a fragrant steaming cup in hand. I have often heard people make similar statements … I can’t do anything before my coffee … I am nothing without my coffee … I can’t deal with life unless I have my coffee.